Split air conditioners: how they work • The Air Geeks, reviews of air conditioners, dehumidifiers and air purifiers. An air conditioner cools a space to maintain its temperature within the desired level. If you live in a place where temperatures shoot during the hot seasons, then you certainly know how important an air conditioner is. Some of the most common air conditioning systems include split systems, wall air conditioners, window air conditioners, portable air cooling systems, and so on. 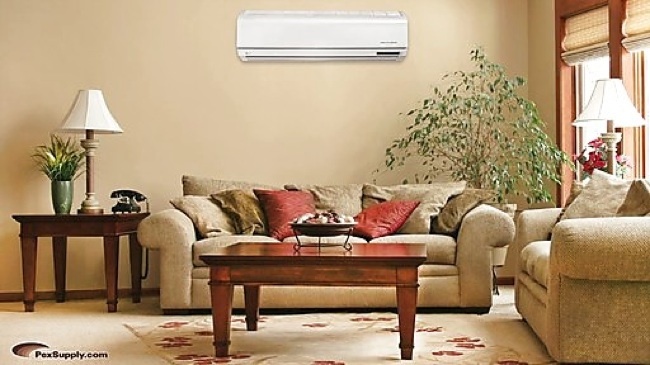 A split air conditioner is one of the most widely used air conditioning solutions for homes. A split air conditioning unit is made up of two parts. One part, the condensing coils and the compressor, is placed outside the house while the other part, the blower and the evaporator coils, is positioned within the house. This air cooling solution is also commonly referred to as a duct-free air conditioner. A split system is a suitable solution for cooling small and standard-sized rooms. The cost of installing a split air conditioner is relatively low. Pretty straightforward at this stage, no? In case you are looking for an air cooling solution that demands less installation effort, then a split air conditioning unit is a viable option. 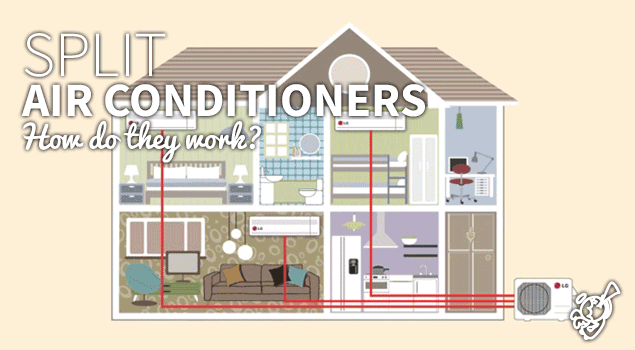 Unlike window air conditioners, split air conditioning units don’t require ductwork. Considering that you could be interested in installing this unit for your air cooling needs, we will explore how it works and its components. Although a split air conditioner has a unique design, it employs the same principle of operation as a window air conditioner or a portable air cooling unit. 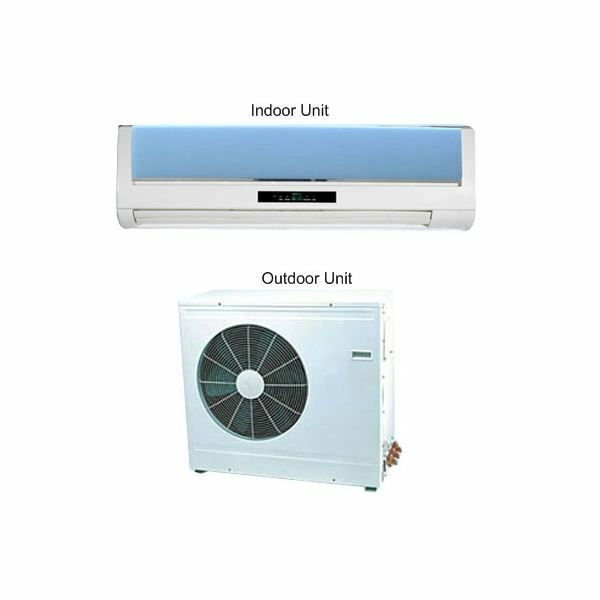 The difference between this air cooling solution and other air conditioners is the separation of its components into two portions. One part is contained inside the house while the other part is located outside the house. The portion that is contained within the house consists of a blower and evaporator coils. The portion that is located outside the house consists of a vent fan, condenser coils, and a compressor. The two separate portions are connected using pipes or tubing. Just like any other air conditioning system, a split air cooling system uses a compressor to pressurize the refrigerant. As the gaseous refrigerant is compressed, its heat rises. From the compressor, the compressed gaseous refrigerant goes through condenser tubes where it is condensed into a liquid. From the condenser tubes, the pressurized liquid moves to an expansion joint. In the expansion joint, the pressure of the refrigerant is rapidly reduced. This causes it to change from liquid state back to gaseous state. During this process, the refrigerant cools by releasing most of its heat. From here, the gas goes back to the compressor for another cycle. How does a split air conditioner cool air? This air conditioning system draws air from your bedroom or living room and passes it over a succession of evaporator coils. This process causes air to lose significant amount heat. Cool air from the evaporator is then forced back to your space through the blower. This cycle is repeated until the temperature of the air in your room is lowered to your desired level. When the target temperature is attained, the unit shuts off automatically. The compressor and the evaporator are the primary parts of any air conditioning system. In a split air system, the compressor is part of the outdoor section while the evaporator is contained within the house. The cooling process is initiated by the compressor. The air from the outside section passes through a tube to the indoor section. The lines, tubing and electrical wires, of a split air cooling system are smaller as compared to the ducts used in other air conditioning systems. It is for this reason that the split air cooling system is commonly referred to as a ductless system. Apart from the compressor, the outer section contains a condenser, an expansion joint, and a vent fan. On the other hand, the indoor section consists of the evaporator coil, blower, and a filter. Most split air cooling systems also have a thermostat system that is responsible for controlling the compressor. Installing the ductwork of an air conditioning system is a time and effort demanding process. With a split air cooling system, the ductwork is not required and the cost of installation is therefore lower. Nevertheless, the indoor and outdoor sections must be connected using tubing and electrical wires. It is cheaper to install connection lines as compared to ductwork. In window air cooling systems, heat exchange in the ductwork lowers the efficiency of the air conditioner. This is a not a problem with split air cooling systems because they use a tubing instead of a duct. The design of the split system therefore helps to enhance the efficiency of the cooling system by minimizing energy losses and heat exchange. As compared to window or wall air cooling systems, split air cooling system deliver better cooling performance when used in large spaces. A split air conditioner is therefore a better cooling solution for large sitting rooms, bedrooms, offices, or multiple rooms. In addition, this air cooling system has less sealing needs as compared to window air conditioning systems. Are you looking for an air cooling system that is suitable for your entire house? With a split air cooling system, you can have a powerful compressor outside and multiple evaporators. For example, you can have an evaporator in each bedroom, living room, dining room and so on. In case of portable air cooling system, you would need a separate cooling system for each room. In case you are planning to transform your house or office by installing an air cooling system, then you have many options to choose from. If you are interested in a powerful system that is capable of cooling multiple rooms, then a split air conditioning system is a viable option. With a strong compressor, the system will be capable of ensuring that all your rooms have the desired environment.